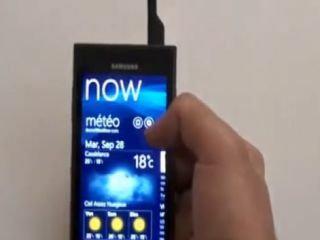 Samsung's forthcoming Windows Phone 7 handset, the i8700, has been shown off in a detailed video walkthrough. This is getting a little bit silly now, with first the HTC Mozart then the LG Optimus 7/E900 phones being unveiled to the internet before this leak – and now we even get word of an FCC filing on two new HTC Windows Phone 7 handsets too. But at least we get a video this time, and a good look at what Windows Phone 7 is all about on the new i8700 (which could also be called the Omnia 7). MobilityDigest posted the video on YouTube, and while the walkthrough is nothing new for the most part, we do get to see the specific Samsung weather and stocks hubs, which don't look the most exciting in the world, to be honest. But if you want to see a detailed whizz-through of Windows Phone 7 before its launch later this month, then check out the video – although we warn you, it does contain images of Coldplay tracks.